Nanosilver industry, categorized as one of the most remunerative business domains, ironically finds it way among the more debatable industrial spheres of recent times. This can possibly be attributed to the fact that the usage of nanosilver is being questioned by regulatory authorities and the like, on the grounds of the ongoing global concern – environmental pollution. Nonetheless, it is prudent to mention that this material finds applications in a barrage of extremely lucrative applications, much like its conventional antecedent, which has undeniably helped contribute toward nanosilver market growth. Traditional silver, endowed with the properties of high thermal and electrical conductivity, has been used for a considerably long while in pastes, adhesives, and inks for consumer electronics. With the advent of nanotechnology however, silver nanoparticles have become somewhat a rage across numerous end-use domains, including the likes of healthcare, F&B, textiles, and specifically, electronics, which jointly constitute the widespread application spectrum of nanosilver industry. Quoting a recent case, Sun Chemical, the largest producer of printing inks and pigments across the globe, made it to the headlines for announcing its intention to present its product portfolio at InPrint 2017, slated to take place in the middle of November at Munich, Germany. Sun Chemical, at the expo, will apparently be exhibiting a range of conductive solutions that encompass nanosilver particles for improved sinter at reduced temperatures. These solutions are expected to be used extensively for printed electronics applications, as per experts, which naturally would bring about a change in nanosilver industry trends. What is expected to stand out though, is the firm’s nanosilver ink, that has been particularly designed to be used in aerosol jet and inkjet systems in the domain of printed electronics. It has been predicted that the nanosilver market player’s nano inks would now pave the way for working with one nanosilver from prototype to production. When commercialized, the product, according to experts, may have quite a powerful impact on the overall nanosilver industry size, and would considerably challenge other players in this business space as well. The concept of 3D printing, that is currently on the front burner in the electronics and tech cosmos, is believed to be one of the most potential growth avenues for nanosilver industry. The proliferation of nanosilver in 3D printing dates to not more than a few years – in Q3 2015, Nano Dimension, now one of vital players of nanosilver industry, penetrated the 3D printed electronics sphere, as the company proudly launched its DragonFly 2020 3D printer that deployed nano inks to print multilayer printed circuit boards. The firm’s highly conductive silver nano inks were apparently developed by means of an exclusive technology license with the Hebrew University, and were commercialized to be sold separately for solar, OLED, and RFID applications. Nano inks, since then, evolved as a viable revenue stream for the company, consolidating its presence across nanosilver market. Additionally, nano inks firmly marked their ubiquity in the 3D printing space, as the company claimed the DragonFly 2020 to be the world’s first desktop-sized 3D printer that can manufacture multilayer printed circuit boards. The projected growth of 3D printing will thus turn out to be one of the prime driving forces for nanosilver industry. The year 2016 witnessed another breakthrough in nanosilver market. A research study concerning nanosilver detected that extruded nanosilver ink, when quickly annealed with laser, enabled the formation of free-standing 3-D structures. In effect, it was inferred that with this technique, one could create 3D structures in mid-air – metaphorically and literally, without any seemingly existing signs of support. While the discovery is yet to sink in, further experiments are being conducted to test the viability of the mechanism, as it would need to be engineered precisely for it to be adopted across a widespread end-use spectrum. It has been concluded that the technique would certainly cause a storm in the 3D printed electronics space, while simultaneously enabling nanosilver industry to chart out a rather lucrative growth path in the ensuing years. As the research on this mechanism extends further, analysts state that it would need to be incorporated into an auto-aligning 3D printing system that may be able to operate alongside the current assembly line processes. As the robust developments prevalent in the 3D printing space continue to make history, it comes as no surprise that nanosilver market stands to gain much from the commercialization of the aforementioned technology. The electronics space is one of the most profitable avenues for nanosilver industry, as the business sphere is ablaze with numerous innovations that validate the prominence of nanosilver in electronic devices. For instance, recently, researchers at the Printable Electronics Research Center, at the Suzhou Institute of Nanotech, integrated a Bluetooth chip and a signal amplification circuit on to a flexible substrate of a skin-like texture by means of printed nanosilver ink as interconnects. The operational Bluetooth circuit has been designed to stick to human skin, and with the integration of a skin patch sensor system, this overall circuit can send out sensor signals wirelessly to a smart phone. The fact that nano inks are being used as interconnects validates the importance of nanosilver in electronics applications, which may have a considerable impact on the overall nanosilver market share. The tech giant Apple, in 2016, made it to the headlines for planning to adopt silver nanowire-based flexible touch displays for its iOS devices in the future. Given the high-grade flexibility of nanosilver, in conjunction with their excellent conductive and transmission properties, it has been predicted that nanosilver market will soon have an array of application arenas - electronic displays, consumer wearables, and numerous other connected devices. 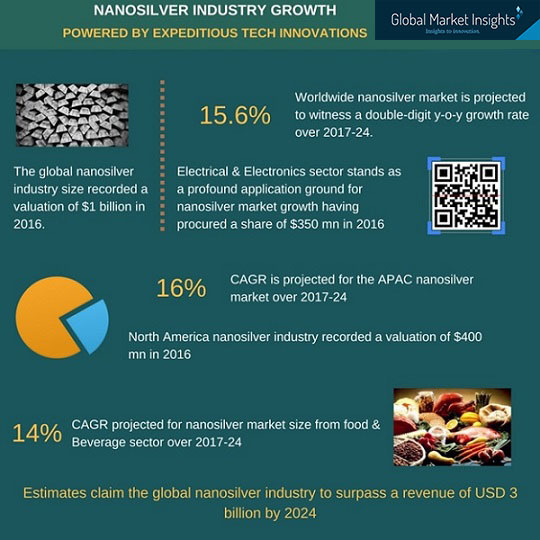 While nanosilver market garners a considerable proportion of popularity from the electrical and electronics space, it is prudent to mention that the material is heavily deployed in a plethora of applications in the healthcare and water treatment sectors as well. A research team from MIT, for instance, recently developed nanowire coated fibers for manufacturing a stretchable and flexible probe to be used in tool development for monitoring the neural dynamics in the spinal cord. The experiment demanded the deployment of conductive silver nanowires, that further validate the vast expanse of nanosilver industry across the healthcare space. In effect, the beneficial characteristics of nanosilver, such as non-stimulation, high efficiency, tolerance resistance, non-allergenic, and more, have led to their incorporation in a mammoth set of applications, which would undeniably impel nanosilver market size. Refuting numerous discoveries that have threatened to disrupt the revenue graph of this business space, nanosilver industry has been forecast to garner a valuation of more than USD 3.3 billion by 2024, with a CAGR estimation of 15.6% over 2017-2024.